THE FIST & THE STEEL fight onward! Riddled with an uncanny disease in the present, Colin King has seen what the future holds - and it is death! Decades from today, destruction looms?and Ninjak and the Eternal Warrior will be our only hope! But even after years on the battlefield, are these weathered veterans still strong enough to forestall an evil that now threatens all of humanity? Glimpse the future of Valiant's two most dangerous men here as Ninjak and the Eternal Warrior baptize their formative partnership in the blood of many men! 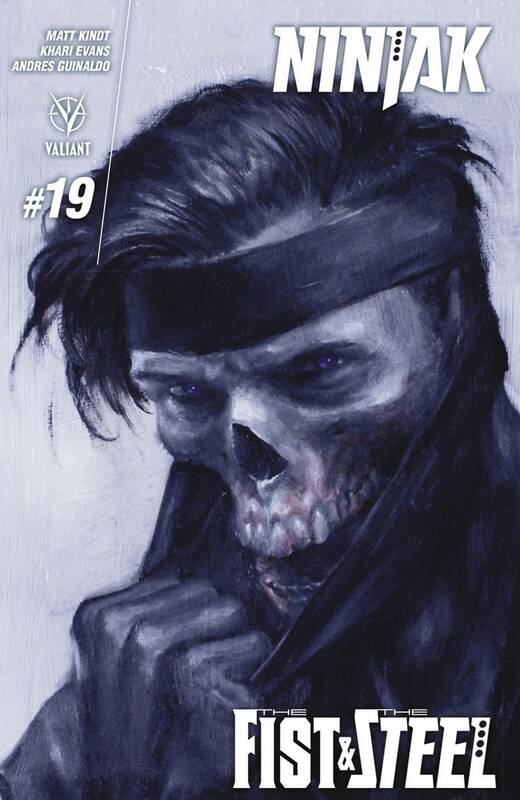 And meanwhile, back in the modern day, Ninjak must exhaust every resource at his disposal to find a cure for the mysterious, Deadside-spawned affliction that continues to destroy his body? But the clock is ticking fast and each step that MI-6's master super-spy takes brings him one step closer to the grave! New York Times best-selling writer Matt Kindt (4001 A.D.) and explosive artists Khari Evans (HARBINGER) and Andres Guinaldo (Justice League Dark) collide today against tomorrow for THE FIST & THE STEEL's next 40-page showdown!